Having space constraint in the kitchen is often seen as a liability but it may not necessarily be so since every liability can be turned into a useful asset. It depends on how space is utilized in the best manner. Surely larger looking kitchens look appealing but one cannot deny that small kitchens also come along with its own advantage. When you carefully consider and have a proper look at your kitchen then it can turn out to be appealing wherein certain remodeling work can be carried out or you can look to make use of the existing kitchen in the best possible way in terms of storage convenience. 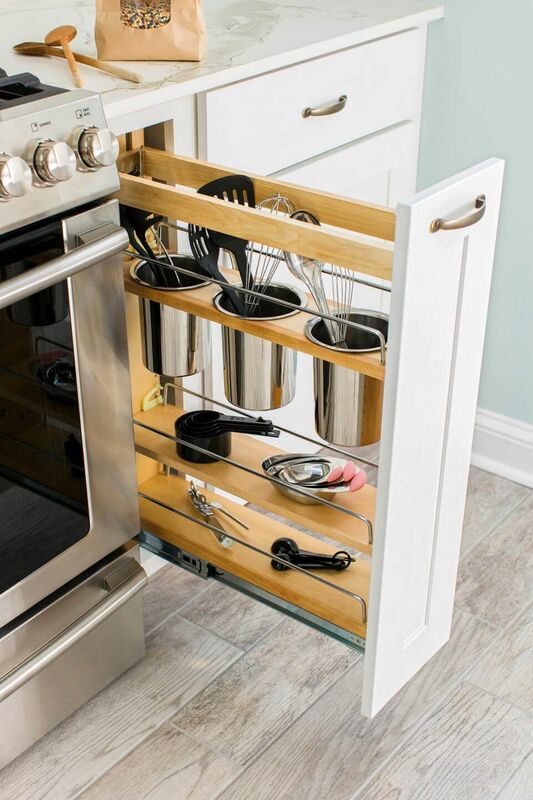 Let us have a look at a few of the small kitchen storage as well as remodeling hacks. For those who are in love with the dark colors can save them for their next house or next project. When it comes to the coloring of a small kitchen then you can always look out for light colors such as light shades of blue, green, yellow or can also go in for neutral color such as white or gray. By doing so you would be instantly adding that feeling of larger space since light colors are known to reflect lots of light. However, ensure that there is an ample amount of natural light in the kitchen to provide you that effect. Having a massive sink or a countertop looks like a luxury but it would not be the ideal choice for all kitchens. When it comes to the smaller kitchen you can allocate a small area for sink and free up other areas of the kitchen for preparation of food and other stuff. When it comes to the small kitchen it is always important to wisely use the space that is available. There is always the need for adding more and more items in the kitchen. You will notice that there is not enough of space for keeping all of the items when it comes to the traditional or conventional kitchen. In such cases, modular kitchens are a blessing since they make optimum use of the space and ensure that the clutter is kept to the bare minimum. Only those which are essential items should be present. For the same, these modular kitchens come along with cabinetry, units, compartments, and drawers. When you have a small kitchen area then the best layout to go in for is the galley kitchen which is also called the corridor kitchen. In this particular layout, there are counters on either side of the kitchen wherein mostly one counter has a stove, dishwasher, sink and so on whereas the other section comprises of counters and cabinetry. In cases of small kitchens, there are not a lot of spaces to adorn for hence when you do get such spaces to adorn then ensure to use them to your benefit. The kitchen backsplash is termed to be the perfect place wherein you can start to provide some fancy treatment to the same by using your creative thinking. Even that small backsplash area is more than enough to instantly liven up the entire room. This backsplash may not be a lot of square footage hence you can go in for some lavish limestone or the glass mosaic within the budget. Visual illusion can play an important role in making a small room look bigger and vice versa. Hence you plan to remodel then do not go in for tiny floor tiles since it can make the kitchen look compact and cluttered. Having larger flooring tiles would give that visual illusion of a bigger and airy room. Also with larger tiles, you are reducing the grout lines which would mean ease of maintenance. The standard size would be 12 by 12 inches or larger. For those who are lacking on the space in the kitchen but are not sure of carrying out any renovation then it is high time that one should trick the drawers, units, and cabinets by making use of some quick and easy space saving ideas. By just getting in some quick creative thinking you can surely make use of every look and corner in the kitchen. Irrespective of the size of the kitchen, every small space matters in the kitchen even if it is a small inch. The space above the window can also be used as a simple open shelf wherein you can display those items such as bowls or plates which are rarely used. At times this space can also be used for displaying some art in case if you want to make the room look elegant. When you have space below the wall cabinets then you can make use of glass shelving which is tucked just beneath these cabinets. It would also provide you with a chance to showcase or store in some glassware. Since these glasses match those with the shelf hence it would not give the effect of cluttered or cramped up. The effect would be almost invisible to anyone. Pots and plates are used too frequently in the kitchen. Hence the best way to store them is by having a plate rack on the wall wherein you can just have a bar tightly placed on the wall and hang the pots and plates to the handle. By doing so it would be easily accessible whenever you need them. It is not necessary that the storage should be done in such places wherein one can reach easily. You can also think about the area under the ceiling for placing on those items which you use rarely. Cabinets can be created in those sections if there is enough space for the same and with the help of a sliding ladder you can also reach out to those ceiling height cabinets or units. Gadgets that are used rarely can be stored away in the higher cabinets. These cabinets can be created above the window or the hood as and where space is available. These cabinets can be created above the window or the hood as and where space is available. When you have space on the countertop that is not used much then you can plan to have an open shelving unit for storage. It would save up space on the floor and also the visual space. You can place bowls, plates, and frequently used items. 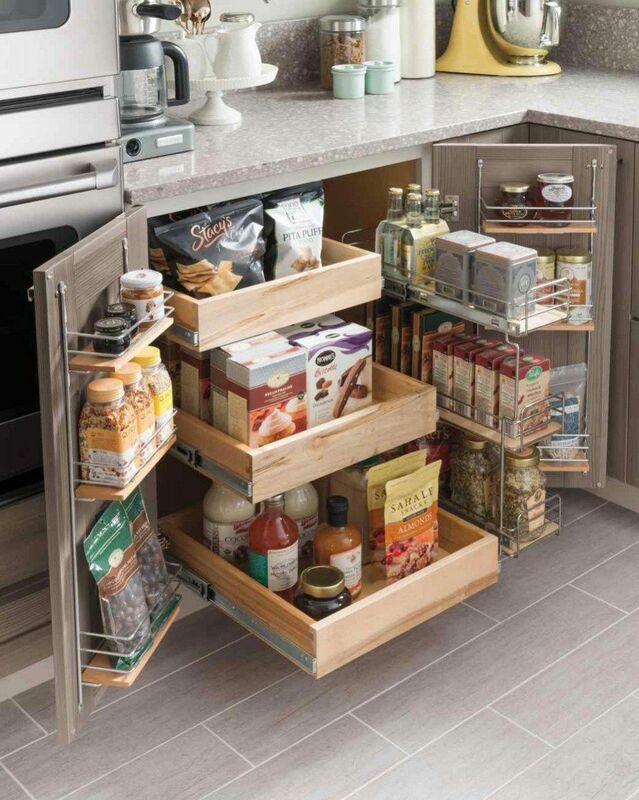 Even a small section in the kitchen can be used as a pantry for storing certain dry items. You can place a slider which would slide out above the countertop so that it would be easier to find certain things.